Fugitive slaves Cora and Caesar are on the run from their sadistic slave master Randall and Ridgeway, a bounty hunter with a long memory. 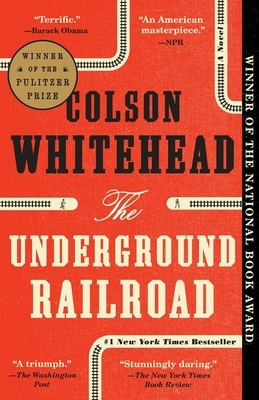 They move slowly north on the Underground Railroad which, in Whitehead’s imagination, is no symbolic trail but actual rails, trains, and conductors. Hiding for months at a time in unimaginable privation, concealed as free blacks for short periods of relative calm, capture for the pair is never more than a shadow away. Cora is the center of this spellbinding novel, and her fierce determination to be a free person in charge of her own destiny will move readers in profound ways.